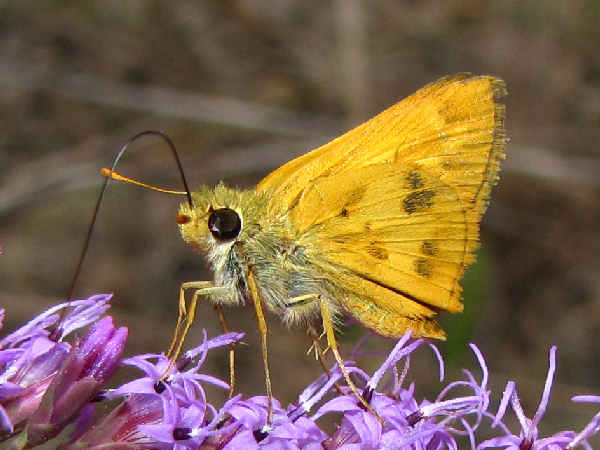 Skipper butterflies, (Hesperiidae) commonly get described as small, flighty, dark winged butterflies. 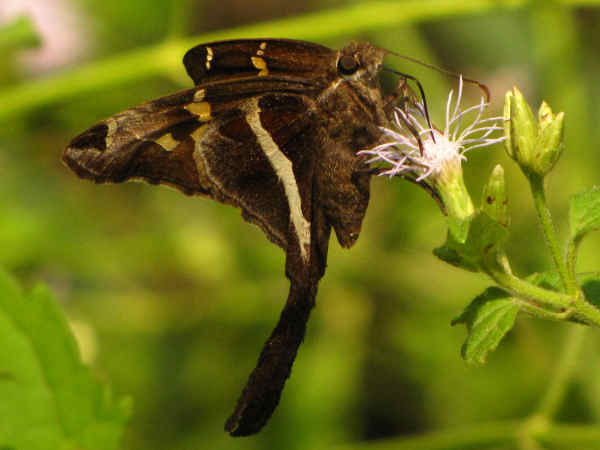 With approximately 275 total species, (plus or minus 10 because the number of documented species varies according to source) skippers rank as the largest butterfly family. Often the brush footed butterflies receive credit as the largest subfamily of true butterflies. Despite what appears to be, at least on paper, family diversity, approximately ninety per cent of skippers belong to either the Spread-wing Skipper or Grass Skipper subfamilies. 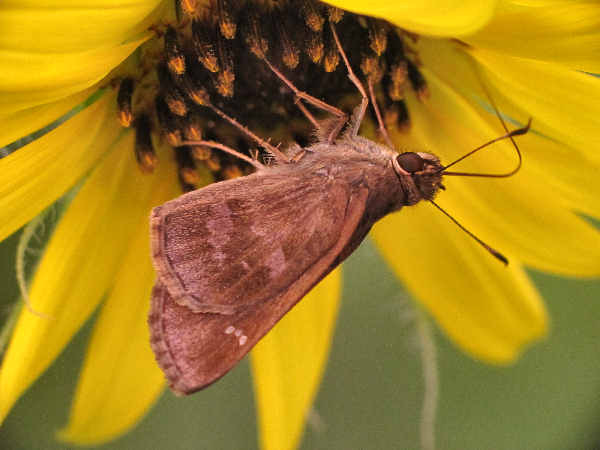 Approximately one hundred and forty native North American grass skippers (Hesperiinae) divide into approximately thirty genera, making it the largest of the skipper subfamilies. The expansive number of native grass species, the subfamily’s larval plant, partially explains their diversity. When it comes to all but butterfly enthusiasts, skipper butterflies don’t rank very well for identification. Most people want to identify the larger colorful brush-footed butterfly species they see in the gardens and back yards. For novice skipper butterflies fans, initial skipper identification of grass skippers can be challenging. The pictures presented here highlight their basic physical characteristics as a group of small butterflies with orange or brown wings, large eyes and thick bodies. 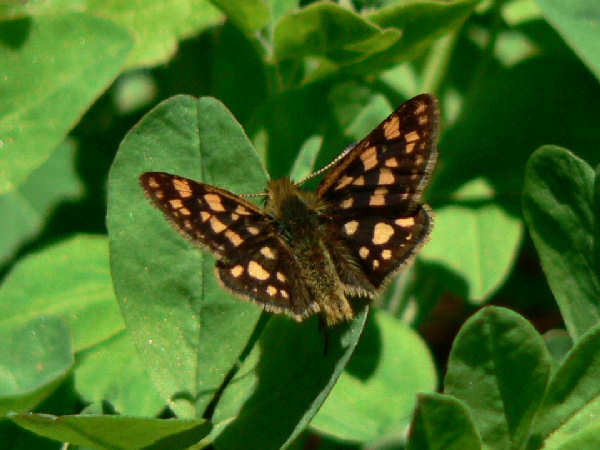 Their habit of folding their wings while perching on leaves (as opposed to the spread-wing skipper), represents an additional identification clue. With so many different species, once anyone gets started with identification, they can keep going for quite a bit of time. 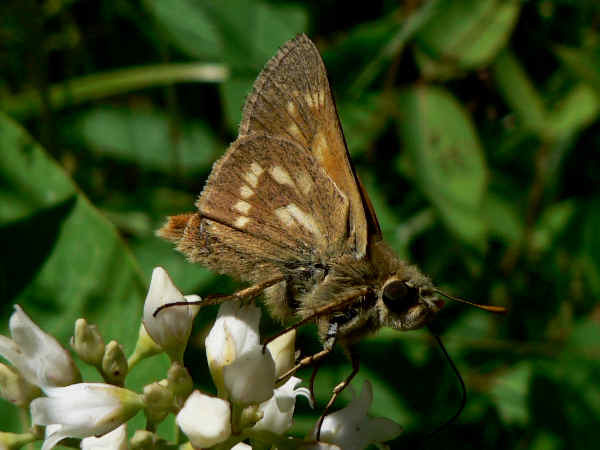 A southern specialty, the Fawn-spotted Skipper shows three small spots on the forewing. The Little Glassywing (Pompeius verna), a common eastern species looks similar to the Dun Skipper, making identification problematic. The light spots on the Dun Skipper are generally less pronounced on both wings, indicating the species in the picture, with more pronounced spots, is the Little Glassywing. The Sonora Skipper (Polites sonora), a fairly common skipper of the Western meadows and wetlands shows wing patterns contrasting larger, separate spots on the hindwing, and a slight pattern of smaller spots on the tip of the forewing. The Whirabout (Polites vibex), small Southeastern grass skippers, fly almost year round in its range. Larvae feed on the dominant grasses in the area such as Bermuda grass. Firey Skipper is very common in the eastern half of the United States, along with having an established population in California. Finally, perhaps three dozen dicot skippers (Subfamily Eudaminae), with familiar names such as cloudywings and longwings receive native North American status. 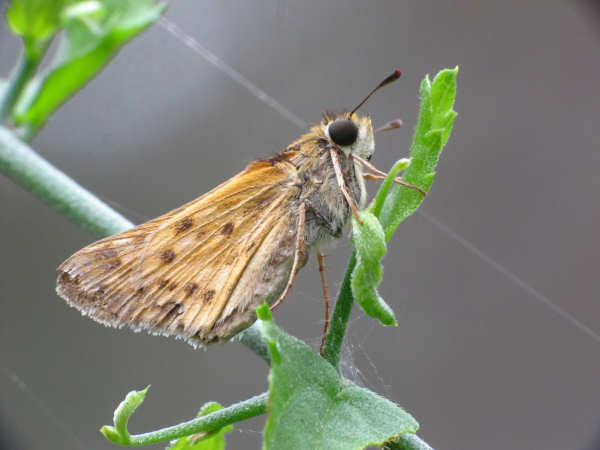 Some experts also classify this group within the larger Spread-wing Skipper subfamily. 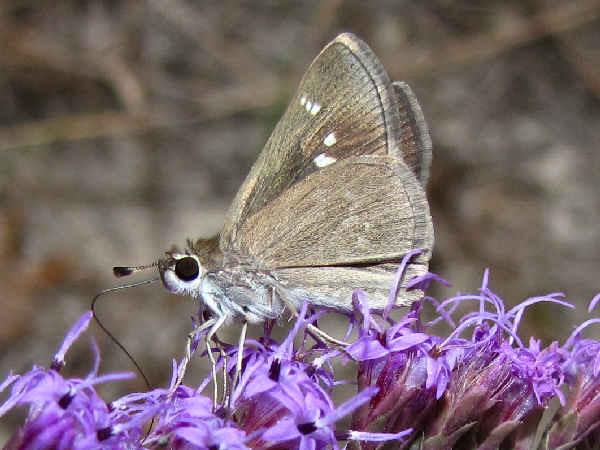 The average North American size for skipper butterflies increases with the inclusion of the approximately one dozen native Urbanus species. Better known as the long-tailed skippers, they also introduce a bit of color into a butterfly family best known for having brown wings. Primarily a tropical genera, three-quarters of native species either have very small and limited established populations or occasionally get checked off on a local field list as it migrates across Mexico-United States borders. 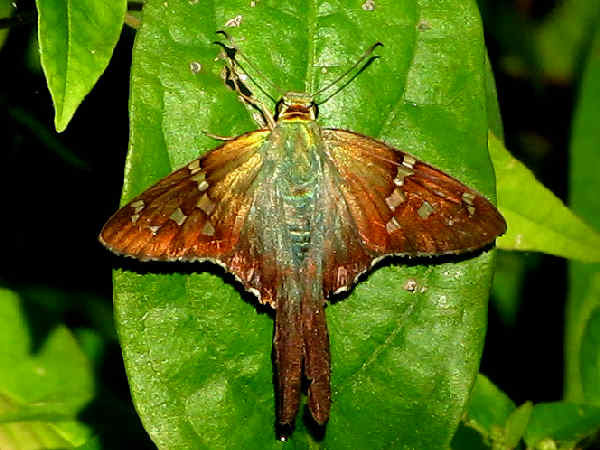 The blue coloration on the thorax, abdomen and top part of the tails differentiate the Long-tailed Skipper (Urbanus proteus), first picture from other species. Its range extends from southern New England, south to Florida and the Lower Rio Grande Valley of Texas. Larvae feed on plants in the pea family. Adults nectar on a variety of flowers in their territory. In comparison, the following picture shows a White-striped Longtail. One of six native Thorybes species, the Northern Cloudywing (Thorybes pylades), extends its range from coast to coast. 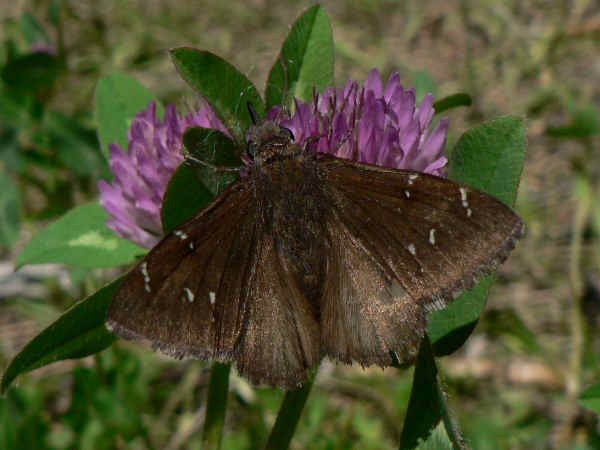 Because all the native Thorybes species, including the Northern Cloudywing use plants in the pea family as larval hosts, the get included in the Dicot Skippers category. Physically, the picture shows your basic, medium sized, brown butterfly, with white spots on the top and bottom sides of the forewings. Another primarily tropical subfamily, Skipperlings, registers five or six native North American species in two genera. The Arctic Skipper (Carterocephalus palaemon), pictured at the top of the page, bucks the general skipperling trend. Its range extends from coast to coast across Canada and southward across the northern United States. 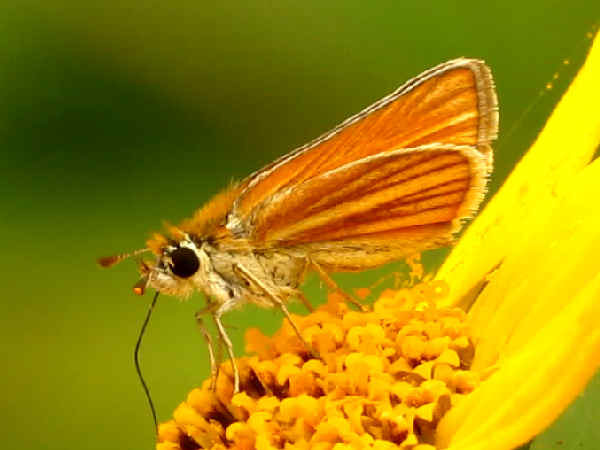 The picture under the Skipperlins heading shows the Southern Skipperling.